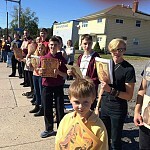 Holy Cross observed All Saints Day with an outdoor procession after Liturgy: carrying icons of the heroes of our faith and the Holy Fire from Jerusalem. We also honored our graduates at Coffee Hour. "Many Years!" On Lazarus Saturday, April 8, Andrew Soboleski was baptized into Christ. May the Lord God grant His newly-illumined servant "Many Years." 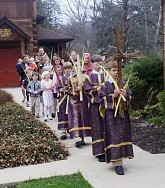 On Palm Sunday, April 9, the children led a procession singing "Hosanna" at the Great Entrance. Archbishop Mark led our Holy Cross Community on the weekend of January 7-8, 2017 in divine services that included the ordination to the Holy Priesthood of parishioner Fr Ignatius Hunter. 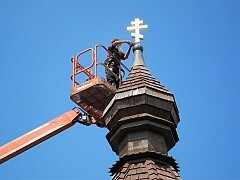 Assisting were Fr Dan, Fr James Chuta, Fr Chad Hatfield, and Deacon Andrew Nelko. The congregation beautifully sang the services and offered prayerful congratulations to Fr Ignatius and Matushka Seraphima. The parish hosted a festal luncheon reception in the Orthodox Fellowship Center following the Liturgy and presented the new priest with gold vestments. Fr Ignatius celebrated his first Liturgy at Holy Cross on Monday, January 9. May the Lord God remember His newly-ordained priest and grant him many fruitful years of pastoral service to His glory! 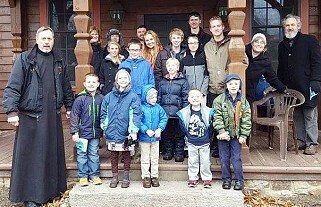 Our parish held our annual St Nicholas Project, with our youth (and others) packing and delivering gift baskets to some of our church neighbors while joyfully singing songs about the beloved saint -- much to the surprise of area residents (and their pets). 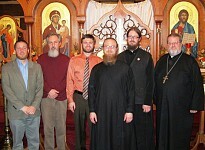 Holy Cross was pleased to host the Mission Choir of St Tikhon's Seminary and the St Tikhon's Monastery Bookstore. Seminary Dean, Fr Steven Voytovich, co-celebrated the Liturgy and offered an inspired homily on the parable of the Good Samaritan, quoting St John Chrysostom commemorated that day. The choir presented a concert at the Fellowship Hour following the Liturgy and parishioners purchased religious items from the bookstore. At the conclusion of the concert, Parish Warden Eric Affsprung presented a financial gift to the seminary on behalf of the parish. Our 13th Annual Election Day Dinner was another great success, thanks to the efforts of an army of volunteers and diners eager to share our signature chicken potpie (and rest awhile from the election drama!). 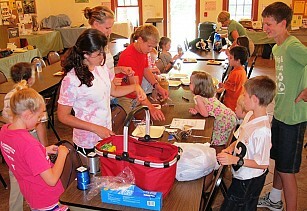 Many thanks to all who helped out -- young and old! Father Thomas Soroka from St Nicholas Church in McKees Rocks, PA offered an edifying and challenging lecture entitled "Ancient Faith: Modern Application." Building on the foundation of Matthew 6, and utilizing extensive "pearls of wisdom" from the scriptures and Church Fathers, he reminded us that prayer is essentially standing before God in the mind of the heart. Fr Tom has two popular podcasts on ancient faith radio: "The Path" and "Sermons from St Nicholas." We're thankful his "path" brought him to Holy Cross! Holy Cross was pleased to welcome Sister Vassa (Larin) for a wonderful lecture as part of her Eastern PA speaking tour. After her talk, we shared "Coffee with Sister Vassa." Check her out on the internet and become one of her "zillions" of "followers." The LYRA choral ensemble from St Petersburg Russia performed another fabulous concert at Holy Cross! 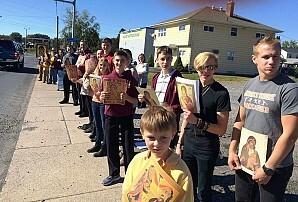 We held our annual All Saints Day celebration with a procession around the church following the Liturgy on June 26; carrying icons of the heroes of our faith on a gorgeous day in Pennsylvania. On July 3, we formally enrolled David Reynolds as a catechumen as he prepares for his baptism in Christ. Who will be next?! Come, join us! Our Holy Cross Youth hosted a Summer Dance, inviting friends to join them in our Fellowship Center for music presented by DJ Meredith under the disco ball. It was a fitting end to the school year! Holy Cross hosted its Third Annual Senior Appreciation Luncheon to pay tribute to community "elders" for sharing their time, talents and fellowship throughout the year. The Auxiliary provided lunch and gifts -- and participants enjoyed a sing-along of old songs led by Fr Dan. 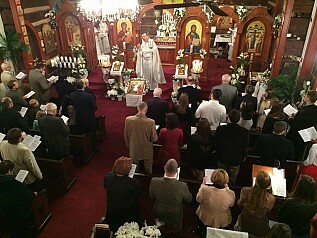 Photos from our services from Palm Sunday to Pascha. 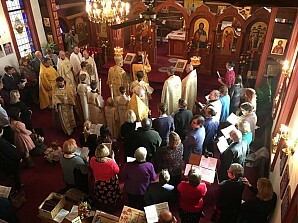 On the Sunday of the Veneration of the Holy Cross, Archbishop Mark and Deacon Matthew Joyner joined the community of Holy Cross Church in Williamsport for the Divine Liturgy. 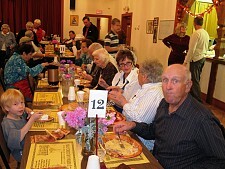 A lenten luncheon prepared by the Holy Cross Auxiliary and warm fellowship followed the service. 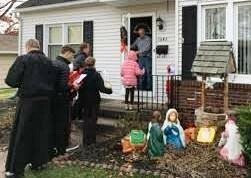 After the Liturgy on St Nicholas Day, our youth, and others, delivered gift baskets to some of our church neighbors and sang songs honoring the saint in what has become an annual tradition of sharing the life of St Nicholas with others. Surprised residents appreciated seeing and hearing our children and were grateful for the unexpected visit! Holy Cross was pleased to host the St Tikhon's Seminary Mission Choir and Monastery Bookstore. Seminary CFO Fr Dennis Swencki co-celebrated the Liturgy with Fr Dan and delivered the homily. At the Fellowship Hour following the Liturgy, the choir sang a brief concert of liturgical hymns and parishioners purchased religious items from the bookstore. Parish Warden Eric Affsprung presented the seminary a financial gift on behalf of the parish and the faithful sang an enthusiastic "Many Years" to our guests. "Drawing Fish into the Net of Christ"
The Holy Cross parish family rejoiced in sacramentally welcoming the newly-enlisted warrior for Christ, Michael (Brent) Fish, on Sunday, November 8, 2015: fittingly, the feast of the Archangel Michael and the Heavenly Powers. His sponsor was David Dylan Jenkins. May God grant the newest member of our Eucharistic fellowship "Many Years." His family hosted a wonderful luncheon following the Liturgy for all to share in their joy. "Holy Chrismation is a Sacrament in which the baptized believer, being anointed with Holy Chrism on certain parts of the body, in the name of the Holy Spirit, receives the gifts of the Spirit for growth and strength in spiritual life." (Philaret's Catechism). Our 12th Annual Election Day Dinner served over 300 rib-sticken, homemade chicken potpie dinners with all the trimmings; thanks to our chairpersons and an army of volunteers. 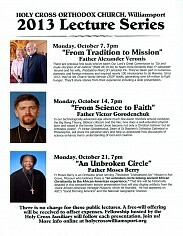 Abbot Tryphon from Vashon Island, Washington gave an inspiring and insightful lecture at Holy Cross on October 19 entitled "Engaging the Culture." He has thousands of followers on facebook, does daily podcasts on Ancient Faith Radio and signed copies of his book "The Morning Offering." He just loves children! It was a pleasure to have been able to host him. 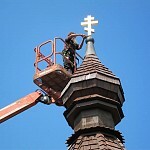 We've had a busy Summer at Holy Cross. 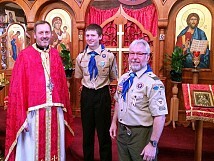 AUGUST 16: Presentation of Alpha-Omega Orthodox Scouting Award to altar boy Boone Jenkins, and Parish Picnic! Our Parish Council hosted a Senior Appreciation Luncheon for our seasoned citizens and guests in our Fellowship Center. Attendees enjoyed good food and warm fellowship. Thanks to those who prepared the luncheon. Special thanks to our parish seminarian Ed Hunter for sharing an enlightening slide presentation of his recent participation on an OCMC Mission Team to Africa. "A good time was had by all!" Phoebe Joan Fowler, daughter of Virgil and Rachael Fowler, was baptized into Christ on Sunday, May 3. Her sponsors are Dylan and Meg Jenkins. May God grant His newly-illumined servant "Many Years!" Our Holy Cross Youth hosted an enjoyable Spring Dance on Friday, May 1 welcoming over 30 for an evening of fellowship, dancing to traditional and pop music, pizza, snacks and ice cream. A Greek line-dance wound its way outside to the backyard! Thanks to all who helped organize the event and those who came to enjoy it. There's talk of planning another! 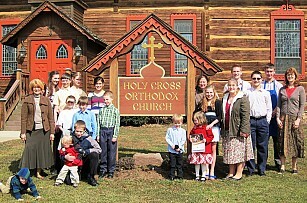 Bishop Mark visited Holy Cross on the Lenten Sunday of the Holy Cross. 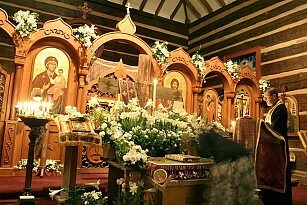 The flower-adorned cross was central to the day's worship. Prior to the Liturgy, the bishop explained to the faithful the significance of the Antimins that rests upon the holy altar and signed it. The beautiful Liturgy was followed by a soup luncheon and fellowship. In the afternoon, parishioners were joined by clergy and faithful from the Wilkes-Barre Deanery as Bishop Mark led the Lenten Vespers, enthusiastically sung by the faithful. Fr George Volkovinsky offered an inspired homily. All in attendance were treated to a delicious lenten meal provided by the Holy Cross Auxiliary to conclude an uplifting day. 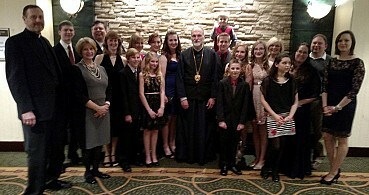 January 18: A contigent from Holy Cross traveled to Philadelphia for the 78th Novogodny Ball. Feb 15: On Meatfare Sunday, our youth hosted another Hot Dog and Ice Cream Sunday Sundae as a community service and to raise funds for their designated charity. 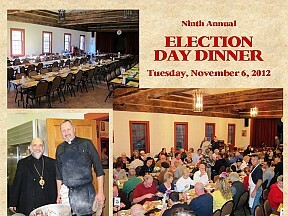 Our Eleventh Annual Election Day Dinner was another great success -- thanks to the chairpersons, kitchen crews, parishioner donations, volunteers young and old, and hundreds of satisfied patrons; with the last serving of the day going to His Grace, Bishop Michael of New York! Our Icon Festival was truly an inspirational and enlightening event in the life of our community and for the many visitors who attended. Special "guest" for the day was the Weeping Icon of St Anna from St Tikhon's Monastery, brought by Fr Steven Voytovich, Dean of St Tikhon's Seminary. After an Akathist Service, we were blessed with a dynamic presentation/demonstration by noted iconographer, Lynette Hull on "Encountering the Icon." 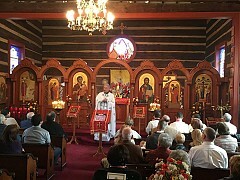 The Holy Cross Auxiliary offered many delicious ethnic foods and desserts for lunch, after which attendees shopped at St Tikhon's Bookstore and watched a video of the Our Lady of Tikhvin Icon. Vespers concluded the day, with a heartfelt farewell to our "special guest." Thanks to all who participated! The fabulous choral ensemble from St Petersburg Russia -- LYRA -- performed a concert of Russian Orthodox liturgical hymns and traditional folk songs -- to another full-house at Holy Cross! 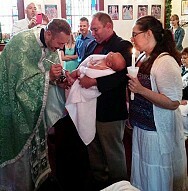 The Baptism of Zachary Stephen Alexander on August 3. A Youth Day on the feast of the Transfiguration, August 6. 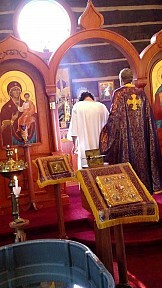 The Tonsuring of parishioner Seminarian Ed Hunter as a Reader on the feast of the Dormition at St Tikhon's Monastery, August 15. And the Annual Parish Picnic, August 17. Glory to God for all things! We began the day by welcoming our newest member -- Chloe Joy Jenkins -- in the Sacrament of Holy Baptism. Then the Liturgy included prayers for all Fathers on their special day. Finally, we took up icons of Our Lord and the heroes of our faith in our annual All Saints Day procession around the church. "Glory to God for All Things!" Our community held an enjoyable Luncheon and Program for our seasoned citizens in the Fellowship Center, hosted by our Parish Council. The good food and warm fellowship indicated the appreciation was truly appreciated! Thanks to those who organized and executed the event; with special thanks to Chris Shatto for sharing her professional expertise and some exercise tips to stay fit. "It was a nice affair!" Holy Cross was honored to welcome His Grace, Bishop Mark for the glorious Paschal celebration in Williamsport! 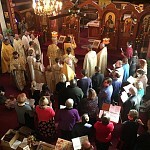 Our Holy Cross community rejoiced on April 6, 2014 in the reception of Cory Michael Chelko into the life of the Orthodox Church and the Eucharistic fellowship of Holy Cross. His sponsor was Eric Anthony Affsprung. May God grant his newly-enlisted warrior "Many Years!" On Sunday, December 8, our group of excited Holy Cross Kids shared the joy of St Nicholas with some of our church neighbors. After Liturgy, they decorated the Fellowship Center tree, prepared 20 gift baskets, then headed out on a cold wintry day to deliver them with song to (surprised!) neighbors who greeted them with smiles. The last stop was at a local assisted living center for carolling -- then back to the parish to warm up! On December 1, 2013, altar boy Keegan Federoff received the Alpha-Omega Orthodox Scouting Award from Father Dan after completing the various elements of an ambitous program of study and community service. Scoutmaster Dan Cero was on hand for the presentation. We congratulate Keegan on this accomplishment and his parents, Ted and Carol, for their support through the process. "Many Years!" We held our TENTH Annual Election Day Dinner -- with huge pots of homemade chicken potpie satisfying the appetites of a couple hundred patrons on a chilly fall day. Thanks to our committee and the army of hard-working volunteers who helped make it a success -- and to our customary final diner of the day; His Grace, Bishop MICHAEL of New York. The fabulous choral ensemble from Saint Petersburg Russia LYRA kicked-off our 2013 Fall Program with another great concert of liturgical hymns and Russian folk songs -- to the delight of a full-house! Parishioners George Lamprinos and Mary Meredith Gee were united in the Holy Sacrament of Marriage on Sunday, September 1, 2013 at Holy Cross. May God grant them "Many Years!" At the conclusion of the Liturgy, we held our annual All Saints Day procession around the church. It was a gorgeous day for us to praise the heroes of our faith! On Pentecost, June 23, our youth hosted another Hot Dog and Ice Cream Sundae Hour after Liturgy -- to the enjoyment of all! Mary Meredith Gee was baptized into Christ on May 26, 2013, taking St Mary Magdalene as her heavenly patron. Daria Armstrong is her sacramental sponsor. Meredith was enrolled as a catechumen by Bishop Mark at our Paschal service. May God grant His newly-enlisted warrior "Many Years!" Fr Dan and the Faithful of Holy Cross were truly blessed to be joined by our Diocesan Administrator, His Grace, Bishop Mark, for the services of Pascha and the bounteous Agape Feast (with lamb!) following. 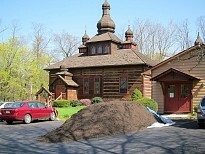 After the Liturgy for Lazarus Saturday April 27, nearly two dozen parishioners (and, of course, their priest) spent the better part of a beautiful day preparing for Holy Week and Pascha, attending to all sorts of things -- cleaning, polishing, flower-arranging and, spreading a 15-yard mountain of mulch around the property. Thanks to all who exercised their stewardship, and muscles, to manifest mountain-moving faith! After the morning "Soul Saturday" Liturgy on April 13, Parish Council members and others participated in a Parish Revitalization Conference; utilizing the Parish Health Inventory Model adopted by the Diocese of Eastern Pennsylvania. The conference began with an introduction by Fr Dan, followed by eight Council members making brief presentations on the eight specific inventory focus areas specifically as related to "life at Holy Cross." They subsequently developed a list of concrete recommendations that will be prioritized and pursued at coming monthly Council meetings. Participants noted (among other things) their appreciation for the conference, bringing issues to light, personally and collectively, that represent tasks and efforts associated not only with "running the parish" but enhancing our faith to better accomplish the "work" of the Church. Many thanks to those who participated! Parishioners Rachael DeParlos and Virgil Tikhon Fowler were united in the Sacrament of Marriage at Holy Cross on Sunday, February 24, 2013. May God grant them Many Years! As part of her Pennsylvania speaking tour and the 35th Anniversary of Holy Cross Church, Human Rights Champion Dr Maria Khoury from St George Orthodox Church in Taybeh Palestine shared her inspirational and courageous story with all ages in Williamsport. On Sunday, November 11, she participated in the parish Liturgy and spoke to the parish youth after Coffee Hour. 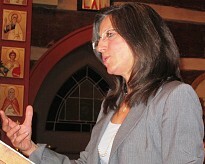 On Monday, November 12, she gave a public lecture on "The Christian Presence in the Holy Land Today." Our NINTH Annual Election Day Dinner was another great success; thanks to our hard-working crews and of course the over-300 patrons who thoroughly enjoyed our rib-sticken, homemade chicken potpie. 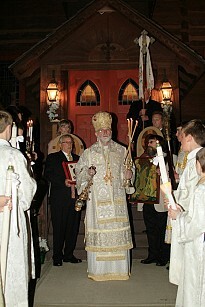 Archbishop Tikhon presided at our 35th Anniversary Liturgy on October 21, 2012. 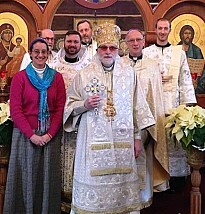 Fr Eugene Pianovich co-celebrated. A festal luncheon followed in our Orthodox Fellowship Center. On Friday, October 26, Dr Anton Vrame presented another of our Fall lectures, entitled "Bringing Life to Faith to Life." Several of our newer members and a few seminary guests shared remarkable stories of their personal faith journeys in a 35th Anniversary event: "Journeys to Orthodoxy." It was an enlightening and edifying evening. Watch for website updates as abridged versions of their stories will (eventually) be included on our "Journeys to Orthodoxy" webpage. The fabulous choral ensemble from St Petersburg Russia, LYRA, kicked-off our 35th anniversary celebration with a concert on Tuesday, September 18. Though the house wasn't as packed as last year (maybe it was the tornado/severe weather alert?) all who came appeared to truly enjoy the memorable evening. Sunday, August 19, 2012 began with the baptism of Samantha Updegrove, daughter of Brian and Jennifer. After Liturgy we held our Annual Parish Picnic (without rain!). The following Sunday, August 26, the parish hosted a special coffee hour in honor of the 34th anniversary of ordination to the priesthood of Fr Dan. 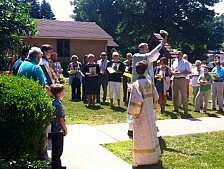 We celebrated the Transfiguration of Our Lord on Monday, August 6, 2012 with the festal Liturgy and blessing of fruit. 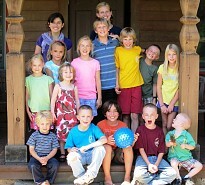 Then our Summer Youth Day included lessons, crafts, a "living icon", singing, food and (of course) kickball! Nonna Brynn Joiner was baptized into Christ on Sunday, August 5, 2012. May God grant her "Many Years!" We held our annual All Saints Sunday procession on June 10, 2012 at the conclusion of the Liturgy, followed by a festive luncheon reception in the Fellowship Center. 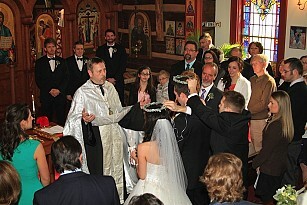 Natalia Kovalak was united to Matthew Seewald in the Sacrament of Marriage at Holy Cross on Sunday, May 27. May God grant them Many Years! Symeon Ezra Barr was baptized into Christ on Sunday, December 11, 2011. May God grant him "Many Years!" The Holy Cross Auxiliary held its Annual Holiday Craft/Bake Sale the same day at Coffee Hour. "AN ICON OF OUR HOUSEHOLD OF FAITH"
Saturday, December 3, 2011 was a glorious and historic day for our Holy Cross community as, for the first time in our history, we were privileged to host the Annual Diocesan Assembly of our Diocese of Eastern PA. 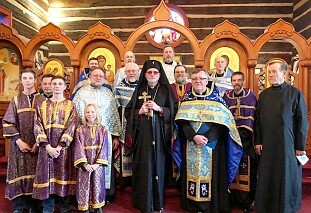 Together with our archpastor, Bishop Tikhon, nearly 80 clergy and lay delegates, observers and guests came together in Williamsport to conduct the business of the Diocese and liturgically share our life in Christ in the divine services. Thanks to parishioners who helped welcome our guests, represent Holy Cross at the sessions, provide food and hospitality, and to the Bishop and Diocesan Council for selecting Holy Cross as the location for the Assembly. Reports may be found on our diocesan website, doepa.org. Delicious, rib-stickin chicken potpie served-up by an energetic crew. Thanks for your support! 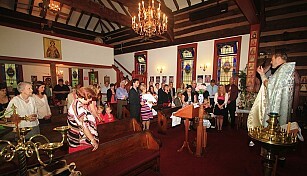 Virgil Fowler was received into the Church in the Sacrament of Chrismation on Sunday, November 6, 2011. 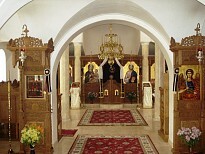 His patron saint is St Patriarch Tikhon. May God grant him "Many Years!" Rachael DeParlos was baptized into Christ on Sunday, October 30, 2011. May God grant her "Many Years!" 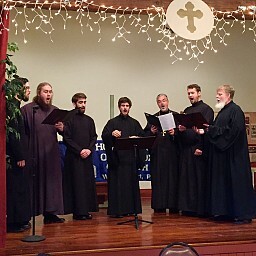 The fabulous LYRA choral ensemble from St Petersburg Russia performed a concert of Russian Orthodox liturgical hymns and Russian folk songs at Holy Cross on September 21, 2011 -- to a packed house! 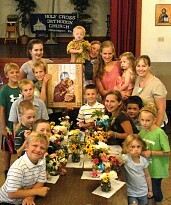 We celebrated the Dormition of the Theotokos on Monday, August 15, 2011 with the festal Liturgy, blessing of flowers and a Parish Youth Day including lessons, crafts, food, singing and kickball. 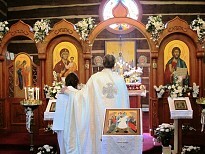 "Beholding the glory of God"
August 6, 2011 began with the Festal Liturgy and blessing of fruit for the Transfiguration of Christ. Afterwards, Holy Cross was one of five local churches included in the "Amazing Grace Tour" sponsored by the United Churches of Lycoming County. 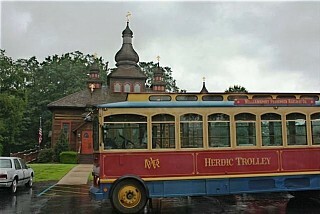 About 150 "tourists" visited -- by car and trolley -- during the day; listened to talks by Fr Dan and enjoying fruit and refreshments hosted by the Auxiliary in the Fellowship Center. Thanks for coming! Join us again soon! Brynach Micah Alexander was baptized into Christ on June 5, 2011. May God grant him "Many Years!" 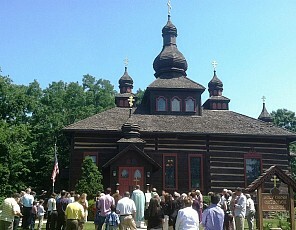 Holy Cross parishioners made their annual pilgrimage to Holy Protection Greek Orthodox Monastery in White Haven PA on Saturday, May 14; participating in the Liturgy, touring the grounds, visiting the bookstore and enjoying the hospitality of the sisters. P A S C H A ! 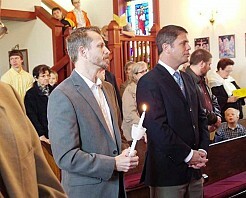 Photos from Holy Thursday to Bright Monday. 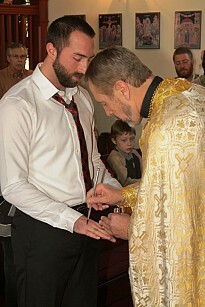 Eric Affsprung was enrolled into the catechumenate by Bishop Tikhon at our April 10 Vesper Service. He was baptized into Christ prior to the Vesperal Liturgy on Holy Saturday, April 23. 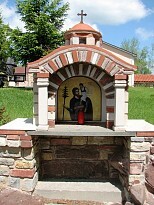 He took St Anthony the Great as his patron saint. His sponsor was fellow-parishioner Herman Ed Almasy. May God grant His "newly-enlisted warrior" MANY YEARS! "Like the children with the palms of victory, we cry out to Thee, O Vanquisher of Death: "Hosanna in the Highest! Blessed is He that comes in the Name of the Lord!" 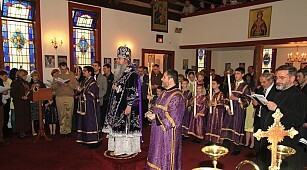 Holy Cross hosted the Lenten Vespers of the Wilkes-Barre Deanery on April 10, 2011. 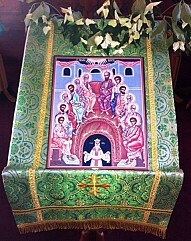 Bishop Tikhon presided. Homilist was Fr John Reeves. 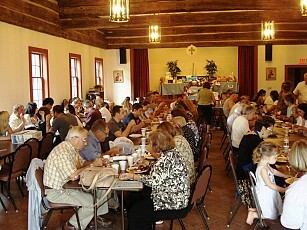 The Holy Cross Auxiliary provided a lenten meal afterwards in our Orthodox Fellowship Center. On Dec 4, our parish youth decorated, heard a story about St Nicholas, and assembled gift baskets to deliver to Holy Cross neighbors after Liturgy on Dec 5 -- sharing the joy of giving, and singing, in this Holy Cross tradition! 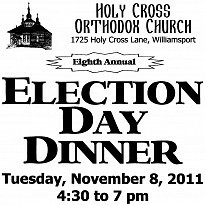 We held our Seventh Annual Election Day Dinner on Tuesday, November 2, 2010. Lots of rib-sticking chicken potpie served by an army of volunteers. August 15. A little rain but a lot of fun! Our annual school was held on August 4 and 5. 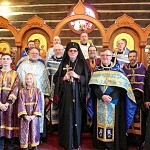 On Saturday, July 31, Bishop Tikhon presided at the sacramental reception into the Holy Orthodox Church of the Almasy and Barr Families at Holy Cross. 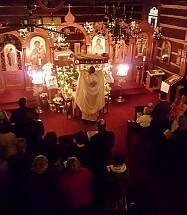 Ten baptisms/chrismations were like "a little Summer Pascha!" We sing "Many Years!" to our newest members! "Blessed is God Who desires that all be saved and come to the knowledge of the Truth." 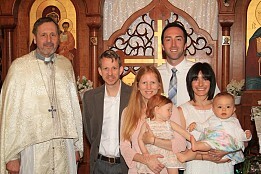 Alexander Federoff was baptized into Christ on June 13, 2010. 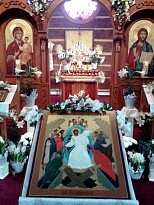 Ann Marie offered these snapshots from Holy Saturday and Pascha at Holy Cross. "Souperbowl of Caring," Canned Goods collection, Children Host "Hot Dog and Sundaes" Hour, Assembling of 100 Health Kits for Haiti... and a Baby Shower! On the Feast of the Entry (Presentation) of the Virgin Mary into the Temple (November 21), Holy Cross hosted a Handmaiden Tea for our young ladies after the Liturgy. Smiling faces seem to show they liked it -- and they learned a bit about the joy, kindness and Godly beauty of handmaidens in the process! "She Who is Quick to Hear"